weather been so bad lately? This continues on the record that was set in November where we experienced an average of 88% cloud cover during daylight hours ~ in other words, WE AIN’T BEEN SEEING THE SUN MUCH! To put this record setting month into perspective, we actually beat out Vancouver (aka the Grey-sky capital of the world) for the top spot on the gloomy charts. Why has it been so cloudy? 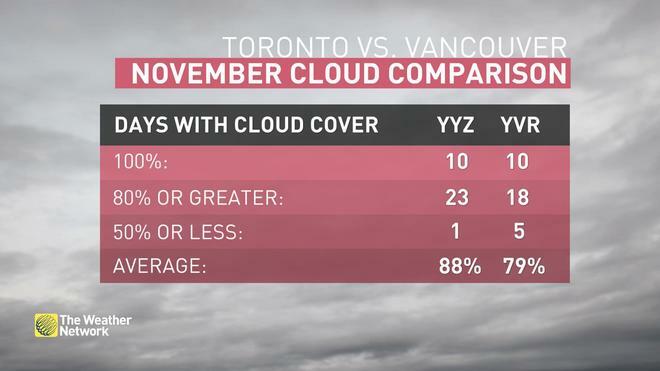 There are several reasons why Toronto has been having so much cloud cover lately but it ultimately comes down to the fact we had 25 days of recorded precipitation in November. This was as a result to multiple weather systems passing through the region that left a consistent amount of water on the ground in addition to the snow created by the lake effect from Lake Ontario. As a result of the increased precipitation on the ground, we saw further cloud cover leading to less sunlight resulting in a negative feedback loop of less & less sun! To put it simply, no, probably not (at least not in the forecast right now). While we haven’t figured out how to control the weather quite yet, there are several things you can do to help your body recover from the lack of sunlight & vitamin D.
First thing you can try is adding blue lights to your home or work space as this mimics the blue light given off from the sun (read more here) or use a full-spectrum light bulb. I have an LED light strip in my condo that allows me to choose whatever colour I want so I will change it from blue-light during the day time to a more red-light at night as this is supposed to help you sleep better! Exercise is also a great combatant of seasonal depression that can arise from lack of natural sunlight!